Aloha! 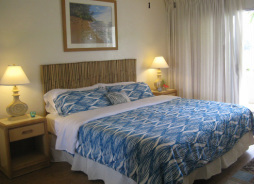 Just steps from the beach we offer a freshly renovated Kauai retreat. Set in a coconut grove with peek-a-boo ocean views, this condo is the perfect place for your next vacation. Completely furnished with a spacious bedroom, bathroom and a full kitchen, it has everything you need for a carefree stay. This first floor corner unit has plenty of windows to let in tropical breezes and sunlight. Doze off to the sounds of the ocean in the new king size bed. Wake in the morning to a beautiful Kauai sunrise. Enjoy time on the lanai. Walk to Waipouli beach. The resort at Plantation Hale has a garden setting and boasts your choice of 3 swimming pools, 2 spas, picnic areas and barbecues. Complimentary parking, WiFi and cable television. The condo is centrally located on the east side of Kauai in Kapaa. Just 200 yards from Waipouli beach! Walk to boutiques, grocery stores, farmer's markets, casual and fine dining restaurants. Nearby is Lydgate Beach Park and Wailua Falls. Try a round of golf at the public Wailua Municipal Golf course, voted by Golf Digest as one of Hawaii's best fifteen golf courses.